BOOKPEOPLE: First of all, no bar should be without this book. It’s absolutely required reading for anyone who owns a cocktail shaker. Have you always been a mixologist? What prompted this thorough exploration of what’s inside our liquor bottles? AMY STEWART: Thank you! I am very much an amateur mixologist — I can make you a nice Manhattan, but I’ve been going to Tales of the Cocktail every year – it’s sort of the SXSW of the cocktail world– and when I hang out with those people, I am definitely out of my league. There are times when it’s best to leave the mixing to the professionals. As for what prompted it, this book was really born in a bar. I wish I could say that I scribbled the idea down on a cocktail napkin, but being a writer, I carry index cards around with me, so I’m sorry to say that I probably pulled an index card out and wrote it down. I had been talking to a friend of mine, Scott Calhoun, who is an agave expert from Tucson. (You probably carry some of his fine books on cactus and succulents and other heat-loving plants) I was on some sort of rant about how everybody who’s into plants should be into botanical spirits like gin, because it’s really just a bottle of distilled plants. Then I started waving my arms around like a maniac and talking about the agave in tequila, the sugar cane in rum, the apples in calvados– and at some point I stopped and said, “Somebody should write a book about that!” And, well, that somebody turned out to be me. BP: In addition to all of the great info and background you provide in the book, The Drunken Botanist, is filled with recipes for all kinds of cocktails. In all of your experimenting, which drink was your favorite discovery? Was there a particular combination of plant flavors that most pleasantly surprised you? AS: Actually, I have to say that my favorite discovery was vermouth. If you think of vermouth as some weird terrible thing that gathers dust in the back of your liquor cabinet, it’s time to take another look. Well, first of all, it’s time to throw out that dust-covered bottle, and then take another look. Vermouth is just one type of aromatized and fortified wine, which is to say that it is wine to which herbs, spices, and fruit has been added, along with a little extra booze to bring the alcohol level up to around 17%. It turns out that good vermouth is highly drinkable on its own. Here on the West Coast, if I’m in a bar that serves Imbue (from Oregon) or Vya (from California), I’ll just order a glass of half sweet and half dry vermouth. It’s very drinkable with food and really lovely by itself. I’m also a big fan of Lillet, a French aperitif wine – and actually, I could go on and on about all the other European fortified wines in this category, but you get the idea. BP: Were there any recipes left on the cutting room floor? Can you share one of your favorite cocktails that didn’t make it into the book? AS: Well, my idea with the recipes was to really talk about “the world’s great drinks,” as the subtitle says. So many of the recipes in the book are classic drinks that everyone should know how to make — an Old-Fashioned, a sidecar, and so on. For every plant, I tried to think of the drink that best expressed what that plant was like in the bottle. It was very subjective — for example, I don’t really like margaritas because I think the lime juice is too overpowering, so I added a drink called The French Intervention, which involves tequila or mescal, Lillet blanc, and Chartreuse. I actually think it’s a better tribute to the agave plant than a margarita is. In some cases, I retooled a classic recipe to pay tribute to a famous botanist. For instance, the Last Word is a classic cocktail that usually contain Chartreuse. I came up with a version that is made with a lemon verbena liqueur called Verviene du Velay, in tribute to the botanist who brought lemon verbena to Europe– Joseph Dombey, who died a rather tragic death while off botanizing, as so many of them did. So I called it Dombey’s Last Word. Here’s one I wish I had included. People love this drink. It’s an instant crowd-pleaser, and it makes me look like I’m a much better bartender than I actually am. BP: Early on in the book you explain, “The history of drinking is riddled with legends, distortions, half-truths and outright lies.” What’s one of the liquor lies you stumbled upon while researching The Drunken Botanist? Debunk for us, please. AS: Oh, there are so many. Most of them involve the famous person — people love to make up stories that connect their product to somebody famous. So for instance, if you read up on bourbon, you will run across this story that Thomas Jefferson offered 60 acres of land in Kentucky to anyone who would plant corn. This almost makes it sound like one of the Founding Fathers ordered Kentucky to become bourbon country. So I went back and read the original Virginia Land Law, which was actually passed a month before Jefferson became governor of Virginia. In fact, settlers could get up to 400 acres, and there were any number of ways that they could prove their claim to the land. Planting a crop like corn was just one of them. I also interviewed historians at the state historical society and the state library, who confirmed that nobody was bothering with sixty acres, and that it didn’t start with Jefferson. This is a little thing, but I really geeked out on details like that. I would spend days tracking down the truth behind stories like that, all for one or two sentences. I could’ve easily spent twenty years writing this book. BP: Let’s say I’m starting a home bar from scratch. What are the staples? What can I scrimp on and when should I accept absolutely no substitutes? AS: Good question! My advice is to skip overpriced spirits. Beefeater is actually a very good gin. Maker’s Mark is a wonderful bourbon. Just because something is a big name brand doesn’t mean it’s no good. The thing to watch for is anything made with synthetic ingredients, like cheap cocktail syrups. I would also avoid those awful flavored vodkas that say they are made with “natural ingredients.” All that means is that they are using plant extracts as flavoring, but they are generally concocted in a laboratory and have nothing to do with the flavor named on the bottle. For instance, a raspberry flavored vodka might not have any raspberries in it at all. If you want to introduce the flavor of raspberries into a drink, get yourself some good, pure Tito’s and drop some raspberries into that cocktail shaker! Keep it real! BP: You’re stuck on a desert island with a magic palm tree that will make you one and only one kind of cocktail for the rest of your life (but will make as much of that cocktail per day as you request, because it’s a kind magic tree). Which drink do you hope that palm tree is mixing? AS: Wow. I’m pretty sure I’m going to have nightmares tonight about being stuck on an island with a tree that produces nothing but booze. It sounds good in theory, but that scenario can go downhill quickly! I think I’m going to go for a mojito here. The lime juice might stave off scurvy for a little while, and the mint is vaguely healthy, and it does have club soda in it, so you’d get a little hydration. Now that I think about it, I could almost justify that is a health drink! Copies of The Drunken Botanist are now available on our shelves and via bookpeople.com. 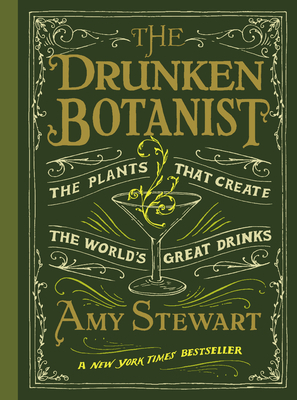 Amy Stewart will join us here at BookPeople to speak about & sign The Drunken Botanist on Tuesday, April 16 at 7pm. Tickets for the signing portion of the event are now available with the purchase of the book. You can also pre-order a signed copy via our website. Amy Stewart is the bees knees! Can’t wait for this event.